If you've had a sleepless night or a prolonged crying spell, you don't have to live with swollen eyes; there are many effective home remedies for puffy eyes. Even better, most can be made with items you have in your kitchen right now. Home remedies are effective for minor, non-medical swelling, the temporary kind that usually occurs first thing in the morning. Chronic puffiness or puffiness that accompanies pain or vision problems should be treated by a doctor. If one eye is larger than the other, seek medical attention. Ice cubes-- Simply wrap ice cubes in cloth or paper towels and apply directly to closed eyes. Chilled spoons-- Place metal teaspoons in the freezer until chilled. Lie back, pressing the spoons to your eyes until they lose their chill. Eye mask-- Place an eye mask in the freezer for a few moments or fill it with cold water. Place it over your eyes until it becomes warm. Chilled eye creams-- Store your eye creams in the refrigerator. This way, they're always available to spruce up tired, swollen eyes. In a pinch, simply splash cold water over your face. Cucumbers have long been known for their soothing properties, and they remain one of the best ways to rejuvenate tired eyes. 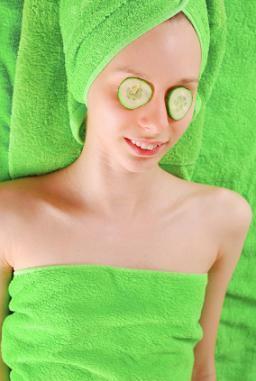 Just slice chilled cucumbers and place them over the eyelids for 10 to 15 minutes. A little known fact is that apples and potatoes can be used in the same way with the same results. For a quick, simple solution, dip cotton balls in chilled milk and apply to eyelids. Caffeine constricts blood vessels, making tea bags a natural choice for the treatment of puffy eyes. Simply soak tea bags, either black or chamomile, in cold water until chilled. Wrap the cold tea bags in paper towels or tissues. Then, lie back and place the wrapped tea bags over your eyes for 10 to 15 minutes. For even more of the fluid-diminishing tannin, try green tea. Try hydrated. Ironically, swelling can be caused by too little water and helped by more water. Drink at least eight glasses per day. Watch your salt intake. Salt causes bloating and water retention, and this can present as eye puffiness. Get enough sleep. There is no better way to combat puffiness than by sleeping. Limit alcohol consumption, especially at night. One of the most obvious signs of a hangover is the reddened, swollen eyes.